The sleeping mat is 20 inches wide, 72 inches long and 1 inch thick at minimum. 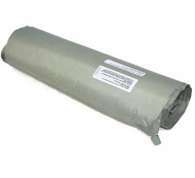 The mat is constructed of nylon fabric fully bonded to urethane foam. The mat is self-inflated when the plastic air valve is opened. Deflation of the mat is achieved by pushing air out through the plastic valve.